All in all, I should be super happy. scale is dropping (48 lbs gone total), feeling mostly pretty good. Two issues at this point. 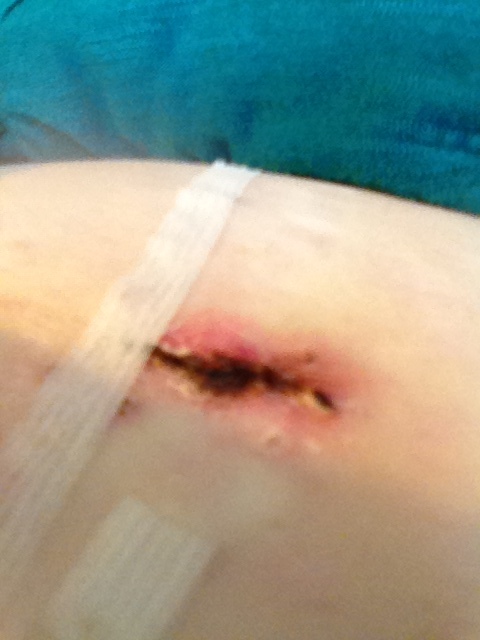 First is I have an incision that is givign me trouble. The 2nd incision from the left (I incorrectly thought this was the one that was oozing a bit in the hospital, but it is not, now that I think about it) is giving me some trouble. It’s been fine ever since surgery, no issues. A few days ago, it pops up open and lets loose some mostly clear ooze. Hmm. 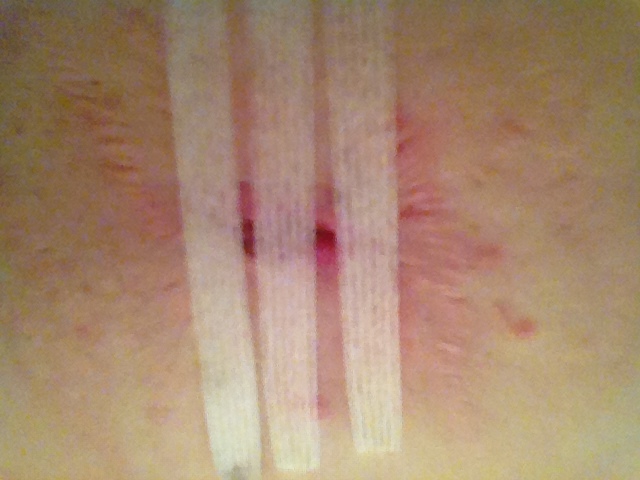 No fever, no real pus, minimal redness (a few millimeters) around the incision. Call the on-call doc and he thinks its a seroma. So basically fine, just pay attention if anything is worse. Today, after a shower I look down at it, and the scab that had formed had fallen off and the incision is gapped open a bit, and seems redder, and has what looks like more serious looking goo, but maybe that is just from the scab falling off. The pictures below are TMI, so if you are squeamish, look away! 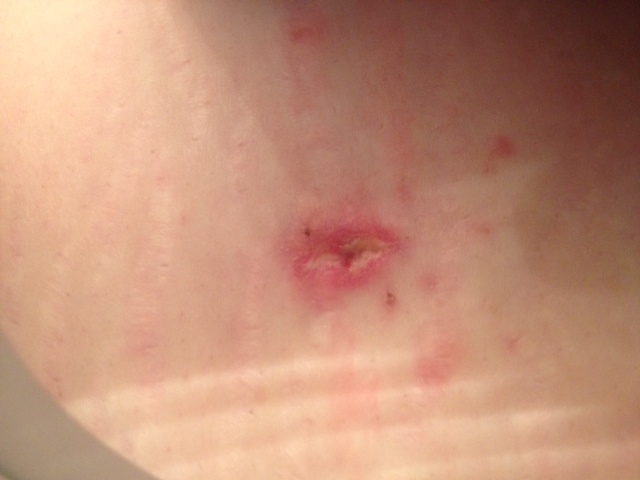 Today 1/9/12 after shower — water must have loosened the scab off and washed it away? In other news, I’m wondering if I need to put a call into my primary care doc to up my antidepressant. I’m not sure at this point if I’m just expecting too much in recovery or whether I am getting depressed, because I just feel like holing up and doing nothing. Work feels like too much right now, everything is sorta blah. I have anxiety, mild depression and SAD, so it could be I need to get more sunlight too. I have a SAD light, maybe its time to use it again. Hmm.